The ZEUS D50 fusion splicing device was developed especially for FTTH applications and offers a fast, simple and high-quality field assembly of connectors and fibres. It is suitable for 2.5 mm, as well as 1.25 mm ferrule technology, for single-mode and multi-mode fibres (250 μm, 600 μm and 900 μm) and cables (1.6 to 3.1 mm). The core of this system is the high-quality crocodile fusion Alberino ferrule assembly from DIAMOND. The ferrule assembly, available in PC as well as APC versions, consists of a machine-polished end face for optimal IL and RL values and a splice protector. The fusion splice is protected and located within the Alberino. This spares costly and space-consuming splice trays, protective systems and fibre management. 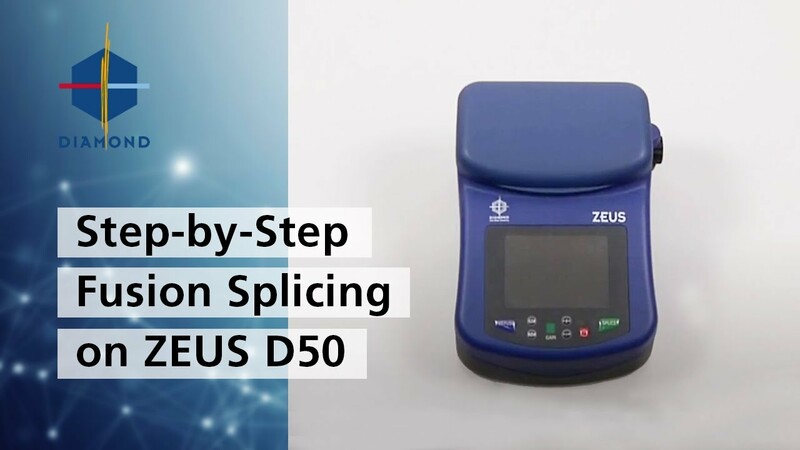 The ZEUS D50 splicing device offers a simple, manual fibre comparison, quick and simple connector assembly on site, fibre to fibre splicing, fibre cleaning in the initial burning stage, adjustable arc power, integrated fibre tensile test, as well as an external video output. In addition, versions complete with extensive fibre/cable preparation and splicing tools for on-site assembly and repair of E-2000™, F-3000™, SC, FC and ST™ connectors are available with SM as well as MM fibres.